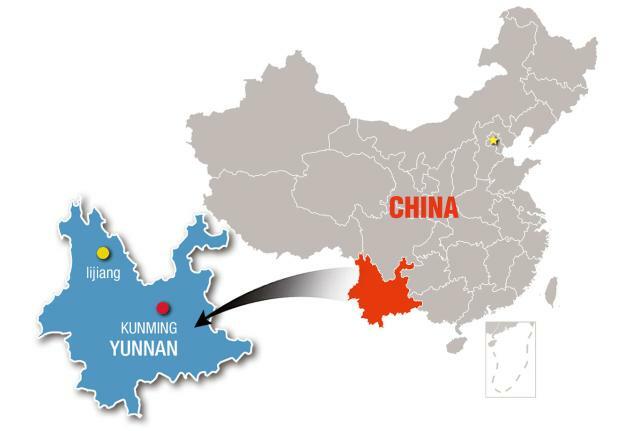 In the northwest of Yunnan, a province which stretches from the mountains of the Himalaya to the jungles of Southeast Asia, lies the ancient town of Lijiang, framed by the snowy peaks of the Jade Dragon Snow Mountain. 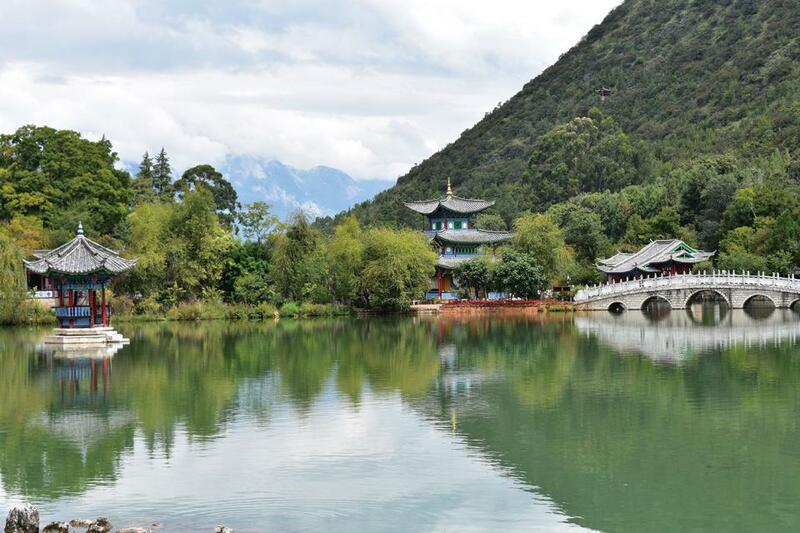 Previously a transit point on the Ancient Tea Horse Road – think the Silk Road, but for tea – Lijiang is known not only for its breathtaking natural scenery, but also as a site of cultural communication between several ethnic groups, including the Naxi, Tibetan and Bai communities. 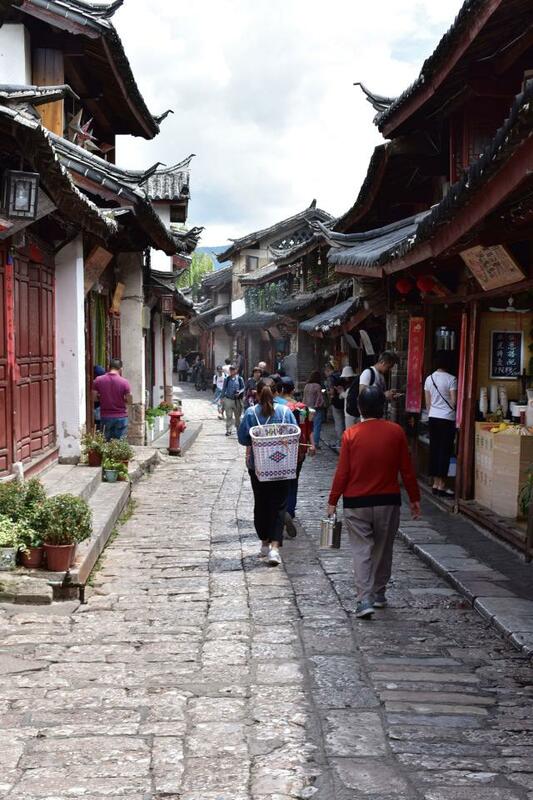 Such is the beauty of the old town that it earned a place on the list of UNESCO World Heritage sites, drawing tourists from afar to wander its cobbled streets. Sixty kilometers north of the town, on the east of the Qinghai-Tibet Plateau, is the spectacular Tiger Leaping Gorge, one of the deepest river canyons in the world. It is also considered one of China’s most stunning hikes, providing both breath-taking views, natural unpaved hiking trails and an insight into the lives of the local Naxi communities who live there. informed us that they would like to send their sons to the UK to find wives. At 5:30am we pulled into Lijiang, greeted by light rain – the cooler weather here was extremely welcome after the heat of Kunming. In contrast with this vision of tranquility, come evening, the streets of Lijiang were absolutely buzzing with people, noises and smells, and near the main square, large rowdy bars seduce passers-by with scantily clad table top dancers and large quantities of beer. The next morning, we caught an early bus into the mountains for the Tiger Leaping Gorge hike, which many people take two days to do. We opted to disembark at Qiaotou where we paid a local shop owner 80 yuan to drive us most of the way up toward the Naxi Guesthouse – this initial section is all road and no views, so can be skipped. Alternatively, the bus can drop you at another spot for a shorter loop walk, but this misses a lot of the most beautiful scenery. Unlike China’s other more touristy mountain hikes, there were no other travelers in sight here. It was also wonderfully quiet, bar of course the odd dynamite explosion in the distance – a large infrastructure project is currently underway to build a tunnel through the mountain. After the Naxi Guesthouse, the trail is marked intermittently with red spray-painted arrows and blue signs. The first couple of hours of the trek were the toughest, constituting a seemingly never-ending series of stone steps winding up the mountain under a merciless sun. Before long one reaches the dreaded “28 bends,” marked by a warning sign scrawled in white paint across the wall of a stone hut. Within this hut lurks a lady issuing warnings to travelers that she is their last chance of procuring drinking water – this is a lie. Drinking water is available for purchase at the top of the 28 bends, as well as at homestay houses along the walk. The bends were indeed tough, though, and lasted about another hour, but we were rewarded at the top by the most spectacular view of the gorge. As we stood on the rocks overlooking the steep ravine, the Jinsha River (literally “Golden sands” the name given to the upper reaches of the Yangtze River) roared furiously below us, a thunderous sound which echoed around the stunning rock faces, their hues of black, grey and white shining in the midday sun. For an even more impressive view one can pay a modest 10 yuan fee (US$1.4) to gain access to a path leading down to an exposed cliff edge, guarded by another lady in a cardboard hut (she waives this if you buy something from her stall). After trying, and failing, to capture the beauty of the scenery with hundreds of photos, we headed downhill through a forest, stopping for a very scenic lunch on the roof of the Tea Horse Guesthouse. The next stage brought with it ever more spectacular Tolkienesque scenery, ferns brushing our legs as we walked under black overhanging cliffs, dodging roaming herds of cows and goats. As we approached Halfway Inn (which, misleadingly, is not halfway but close to the end of the hike), the temperature began to drop and suddenly dark clouds were blowing across the gorge. We hurried along the narrow cliff edge, scrambling over rocky landslide debris and over waterfalls, keen to make it to the end of the trail before the storm hit. Even in good conditions the narrow path is not safe, dropping off sharply down the gorge. One stumble and you could be on your way down to the river. The hike ends with a steep half-hour scramble down the mountainside to Tina’s Guesthouse. Although this marks the end of the longer hike, those who plan to spend the night here may choose to continue on down to explore the river. However, we were keen to make it back to Lijiang that night. As evening set in, too late to intercept the last bus from Shangri-la back to Lijiang and with no taxis available, the landlady talked her grudging husband into driving us back for a total of 450 yuan (US$65). We climbed into his car as the sky darkened, setting off down the winding road with stunning views of the gorge just as streaks of lighting lit up the sky ahead, thunder roared in the distance, and a heavy rain began to fall.